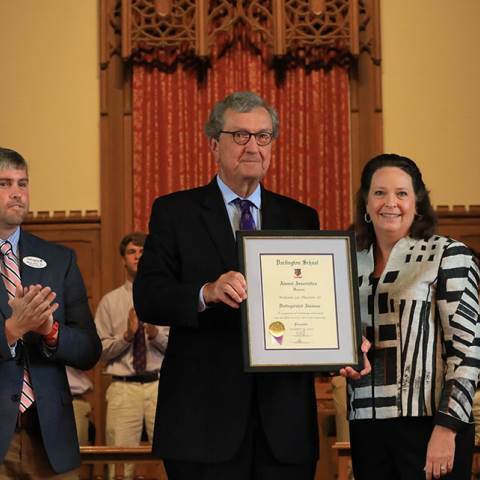 Established in 1983, the Distinguished Alumnus/na Award is given by the Alumni Council. Nominations are solicited each year from the alumni body. Upon first meeting Villa (Sulzbacher) Hizer (’66T, LD ’12), you might not peg her as a risk-taker. A successful businesswoman and community leader with a heart for serving others, she is the epitome of southern charm. But the truth is, Hizer sees great value in taking risks, both personally and professionally. Lee enrolled at Darlington in August of 1964 and, in his three years as a Tiger, became involved in many aspects of campus life. Today he's an attorney and current chairman of Burr & Forman in Birmingham, Ala.
Dr. Dan Hanks (’61, LD ’12) and his family have had a nearly-90-year relationship with Darlington School, and he’ll tell you himself that he is better for it. Mr. Lyons Joel Heyman ’44, Rome, Ga.
Mr. William S. Morris III ’52, Augusta, Ga.
*Mr. F. Frederick Kennedy Jr. ’60, Augusta, Ga.
Mr. W. Frank Barron Jr. ’48, Rome, Ga.
*Mr. George G. Griffin Jr. ’68, Rome, Ga.
*Mr. Harold F. Hunter Jr. ’49, Rome, Ga.
Mr. Stephen D. Potts ’48, Chevy Chase, Md. *Dr. Benson R. Wilcox ’49, Chapel Hill, N.C.
Dr. Frank C. Wilson ’46, Chapel Hill, N.C.
Mr. Thomas G. Cousins ’48, Atlanta, Ga.
*Mr. Joseph W. Grier Jr. ’33, Charlotte, N.C.
*Mr. John W. Maddox Sr. ’27, Rome, Ga.
Dr. John L. Ochsner ’44, New Orleans, La. Mr. David M. Lacy ’49, Zebulon, Ga.
*Mr. William A. DuPre III ’51, Rome, Ga.
*Dr. Mims Gage Ochsner ’45, New Orleans, La. Mr. George H. Johnson ’54, Atlanta, Ga.
Mr. John W. Thatcher ’44, Miami, Fl. *Mr. C.G. Mills ’55, Chattanooga, Tenn.
*Mr. J. Daniel Hanks Sr. ’27, Rome, Ga.
*Dr. William P. Harbin Jr. ’22, Rome, Ga.
*Dr. Thomas S. Harbin ’33, Rome, Ga.
*Mr. Alfred Lee Barron ’26, Rome, Ga.
*Mr. Charles Alexander Hight ’32, Rome, Ga.
*Dr. Edgar F. Shannon Jr. ’35, Charlottesville, Va.
*Dr. H. William Scott Jr. ’33, Nashville, Tenn.
*Mr. Ramsay D. Potts ’34, Washington, D.C.
*Mr. Earnest Paul Rogers ’21, Atlanta, Ga.
*Mr. J. Thomas Watters ’44, Rome, Ga.